The PhotoPass location for the 2011 light display. The Osborne family of Arkansas decorated their home every year and each season the display continued to grow. The family decided that the lights should be shared with the world and partnered with Disney to bring the magic to Hollywood Studios. The display was donated to the park in 1995 and has been a holiday favorite of Walt Disney World Resort guests. This evening, Disney’s Hollywood Studios will get a little brighter with the 2013 premiere of The Osborne Family Spectacle of Lights. Guests of the park will become immersed in twinkling lights that dance to the music of the season while strolling the Streets of America. Features of this holiday display include; a spinning globe, Santa and his sleigh and a carousel made entirely of lights that sits atop one of the buildings. The lights are turned on every evening around 6PM and are accessible until closing. Each night a ceremony occurs in which the “family of the day” is joined by Goofy to flip on the switch and light the Streets of America. This is generally a very crowded event so it is recommended that you get to the area 30 minutes prior in order to get a decent view. If you prefer to stroll the display with more minimal crowds, wait at least an hour after the lighting ceremony. When the park has late evening Extra Magic Hours, take advantage of the time and view the lights with smaller crowds. You can find the Extra Magic Hours for the park through Disney’s calendar tool located here. Holiday beverages including hot chocolate and cider can be found at vendors around the display…some holiday themed alcoholic options are also available throughout the season! Looking for the perfect spot for a holiday photo of the family? The middle of the display offers a PhotoPass location with a backdrop of towering lit trees and toy soldiers. These photos make great holiday cards or can be framed as gifts for loved ones. The newly introduced “Glow With the Show” ears are synced with the lights and can be purchased for $25 in the park. The ears are interactive with several shows including; “Fantasmic” at Hollywood Studios and both “Wishes” and “Celebrate the Magic” at the Magic Kingdom. If you have never seen the Osborne Lights in person, I highly recommend the experience. It is a magical way to get into the holiday spirit…and Disney surely knows how to do the holidays! 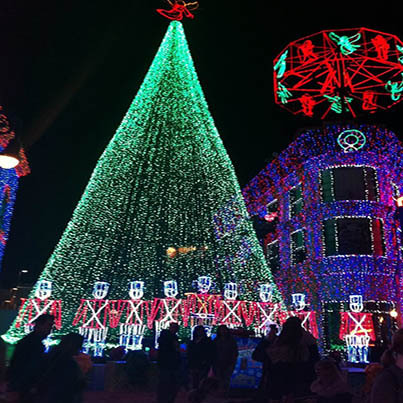 Have you seen The Osborne Family Spectacle of Lights? This entry was posted in Disney Hollywood Studios, The Osborne Family Lights, Uncategorized, Walt Disney World and tagged Celebrate the Magic, Disney, Disney Hollywood Studios, Fantasmic, Goofy, Magic Kingdom, The Osborne Family Spectacle of Lights, Walt Disney Company, Walt Disney World. Bookmark the permalink.